Ishiuchi Maruyama ski and snowboard resort, one of the larger resorts in Japan and located in the Minamiuonuma region of Niigata Prefecture - previously known as Shiozawa, just to the north of Yuzawa town - was originally funded and developed by ski enthusiasts living in Tokyo more than 50 years ago. The 2018-2019 season sees some major exciting new developments at Ishiuchi Maruyama with numerous modern new facilities opening. A brand-new Resort Center building offers all the facilities required for a ski resort base. And on the slopes, this season sees the introduction of the world’s most advanced ‘combi-lift’ called Sunrise Express, a new triple lift and a new Snow Land area! The brand-new Sunrise Express lift combines a 10-person Gondola with 6-person hooded chair lifts – all operating on the same line. You can choose between riding a ski lift or a Gondola cabin. The warm and comfortable Gondola is perfect if you just want to use ascend the mountain for sightseeing and playing in the snow activities. Both the chair lifts and gondola are latest models, offering an extremely steady and quiet journey up the mountain. Luxurious heated seats also add to the feeling of a ‘First Class’ ride, making this new lift an experience in itself. From the top of the Gondola you can enjoy views of the Uonuma plain along with some gentle slopes that everyone can enjoy. As well as a new Gondola lift, a brand new triple lift is also being introduced this season by the Monster Pipe facility. A new Snow Land area opens this season close to the top Gondola Station offering a safe place for small children to enjoy playing in the snow. The fun Ishishi and Maruru characters (below) live at Ishiuchi Maruyama and are waiting to join in the fun! You don't need to ski or snowboard to get up to Snow Land.... just take the Sunrise Express Gondola ski lift. 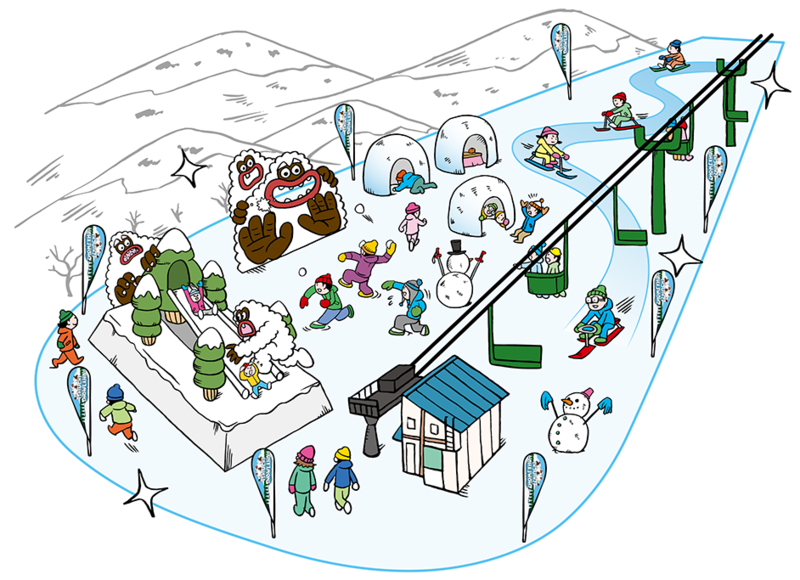 A special return Gondola ticket is available for 1,500 yen (adults), 1,000 yen (children). There are other areas for children by the resort base areas. Ishiuchi Maruyama has long been famous for its extensive 'nighta' night time operations. Nighta is daily from Friday 28th December 2018 until Saturday 16th March 2019, from 4:00pm until 8:30pm. On weekdays the Chuo Area (via the new Sunrise Express gondola/lift) - is open for night time operations. On nights before holidays and between 29th December 2018 and 5th January 2019, the Hatsukaishi Area and Kanko Area also open for nighta. This is for you if you are new to park! This pipe is huge on a 'world scale'! This facility is run by Minamiuonuma city and a separate charge is required. Special 'Powder Areas' are available on the upper part of the mountain and the Oumaruyama course and Giant course are areas where you can enjoy top quality untouched Niigata snow. In this region, it is not unknown for a full meter of snow to fall in one night! Make an early morning start to hit the powder in a morning after a big snowfall. There are 24 places to eat at Ishiuchi Maruyama offering a huge range of choice and surely something for everyone. Some restaurants are in spectacular locations offering wide panoramic views of the surrounding mountains. A day at Ishiuchi Maruyama is a perfect chance to try out some delicious local specialities, such as the famous ‘koshihikari’ rice and ‘Echigo mochi-buta’ pork. Enjoy your meal! 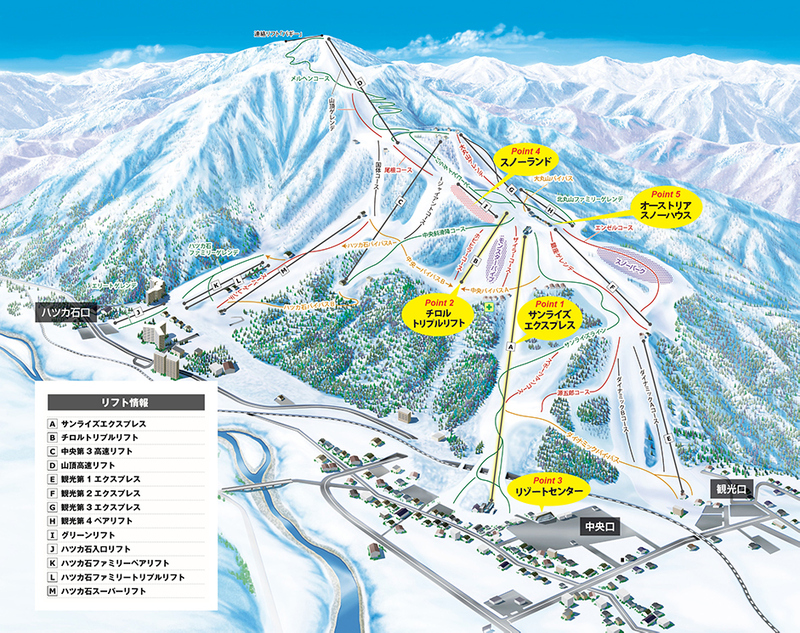 The BIG MOUNTAIN Yuzawa Snow Link ticket is valid at Ishiuchi Maruyama and also the connecting GALA Yuzawa and Yuzawa Kogen ski and snowboard resorts. It is easy to get to Ishiuchi Maruyama.... the resort is located just 200km to the north of Tokyo and close to the centre of Yuzawa Town. Just one and a half hours from Tokyo using the Joetsu Shinkansen bullet train to Echigo Yuzawa Station. There is a regular free shuttle bus service running from Echigo Yuzawa station to the Hatsukaishi and Chuo entrances of Ishiuchi Maruyama. The journey from Echigo Yuzawa Station to takes just 10 minutes.